Sometimes, in order to find a real escape, you just have to strike out into the wild and pit your skills against a wily fish or elusive game animal. It’s one way to really get away from it all, a sure effort to connect with your wilder side, and just the kind of wild adventure that many dude ranches specialize in. 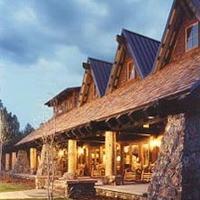 The Lodge at Chama (open year-round) is a 36,000 acre retreat in the rugged San Juan Mountains of Northern New Mexico and owned by The Jicarilla Apache Nation. Over the past five decades, the lodge has developed a widely-acclaimed game management program that has helped establish thriving native populations of deer, elk, buffalo, bear, turkey and grouse. Elk hunting is a speciality at the Lodge, but you can also try fishing/ flyfishing, hiking, wildlife tours or photography, hunting, cross-country skiing, snowmobiling, ice fishing and shooting the sporting clay. In Texas, at the JB Hunting and Guest Ranch (near Palacios), the terrain varies from rolling grassland to thick woodlands and cactus-surrounded areas. They offer professional guided hunts with an authentic, down-to-earth enviroment. You can go for hogs, rams and many exotics, with a variety of different hunts such as rifle, bow, dog & knife, stand, safari and many more types. Or go way outside the box, to La Pampa Argentina and the Poitahue Hunting Ranch. It’s a scenic ranch, where the terrain ranges from woods, to green plains, and rolling hills, all rich in various fauna. Its a mix that assures unique scenery and a truly wild hunting experience; go for red deer stags, boars, wild goats, blackbucks antelopes, pumas, and exotic species. Just remember: the season here is opposite of that in the northern hemisphere (their summer is December, January, February). Editor’s note: this is the last in a 5-part series: Americans need a dude ranch vacation NOW.